Bequeathed by the misses J. L. and B. Naylor 1983, on behalf of the late Mr. and Mrs. P. Naylor. 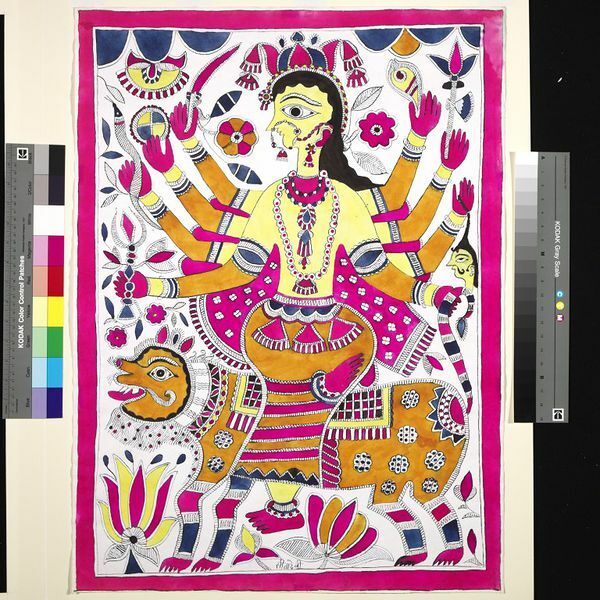 Painting, in ink and coloured paint on paper, the multi-armed Goddess Durga is shown holding a variety of objects in her hands including snakes and a severed head, seated upon a spotted yellow-skinned lion against a floral background. Madhubani painting, also called Maithil or Mithila painting, originated in the Madhubani district of Mithila, Northern Bihar. Traditionally the paintings were drawn on interior walls in the village houses by Hindu women of the Brahmin and Kyshath castes who handed down their visual knowledge from one generation to the next. The folk paintings represent a variety of symbolic meanings mainly associated with the celebration of fertility in Madhubani weddings and seasonal rituals, but also include the major gods and goddesses of the Hindu pantheon, in particular Sita, the wife of the god Ram, and a central figure of the Hindu epic the Ramayana. The Mithila painting tradition was largely unknown to the outside world until 1934, when a major earthquake hit the region. The paintings came to the notice of W.G. Archer, who was at that time an officer in Madhubani district, and later Keeper at the Victoria & Albert Museum, and the first to document the paintings and publish the first article on the subject in 1949. During the 1960s, the paintings started to be produced on paper for sale. Since then, Madhubani paintings have remained the most recognisable and popular of Indian folk painting styles, and several of the artists, notably Ganga Devi and Sita Devi, became known at both national and international level. The continued success of the works on paper has provided both an additional income for the rural artists and an alternative perspective of contemporary art within the wide range of Indian painting styles. Archer, W.G. 'Maithil Painting', Marg, vol.3, no.3., 1949. Archer, Mildred, 'Indian Popular Painting in the India Office Library', London, 1977. Jain, Jyotindra, 'Ganga Devi. Tradition and Expression in Madhubani Painting', Mapin, Ahmedabad, India, 1997.